Perennial weeds persist over the winter as tap roots, root tubers or underground stems known as rhizomes. Getting rid of them involves more than simply cutting them to the ground. Although these tough weeds are a nuisance, if you do the right things with a determined effort you can be rid of them. And this link gives you the ways to control perennial weeds without expensive weed killer. If you want to control annual weeds click here. But you'll find specific examples for weed identification below. There's information on how problem weeds grow so that you can choose the right organic weeding method to avoid making the weed problem worse. Some weeds are associated with cultivation while others are cultivated garden plants that become invasive garden weeds. Do You Recognise This Garden Plant? But over time Mint will extend far and wide if not checked. So when you grow plants like Mint enclose them in a container. The traditional method was to use slates, or you could use roof tiles, buried vertically in soil. But when left to spread the roots don't go down very deep. It can easily be forked up - see the Ways to Use a Garden Fork described on this link. Heart shaped leaves with a serrated margin and are covered with stiff stinging hairs. Nowadays I use the young leaves to make a wholesome herb tea. Nettle flowers are small of an inconspicuous pale green. Mature plants shed hundreds of seeds. Be sure to remove top growth to the compost heap before flowers turn to seed. Dont compost flower or seed heads directly - a flame weeder will destroy them. The stringy roots are bright yellow but look out for cream / purple stems that extend this perennial weed just beneath the surface. The plant is pretty easy to remove and comes out in clumps when using a garden fork. To save being stung avoid brushing against it. First slice the top growth down to a 1 foot stem with a sharp sickle or hedge clippers. This prevents tall stems brushing onto you as you fork. You can either wear gloves or grasp the nettle firmly. - see the Ways to Use a Garden Fork described on this link. Don't forget that a nettle patch is valuable for wildlife. Nettles are rich in nutrients and should be recycled. They make a good compost accelerator and you can even make liquid nettle feed in the same way as liquid comfrey feed. On land that has been cultivated the rhizomes go deeper. Then, removal by hand is laborious. A mulch covering such as cardboard or polythene maintained over say 2 growing seasons should reduce the problem considerably. Find ways to grow and control perennial weeds using sheet mulch - on this link. Some gardeners decide to rotavate weeds with a power tiller. This should be done in dry conditions and needs repeating over 2  3 months whenever regrowth appears. One-time rotovation only worsens the problem by chopping Couch weeds into many pieces - there's more on power tillers here. Seperating the Couch Grass among your plants. This tough perennial weed will grow into and through your cultivated plants making them unsightly. Then you'll have to lift your plants whole to seperate the weeds. 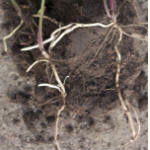 You can reveal the intimately entwined couch grass rhizomes with less damage if you spray the root ball with water. A climber with spear shaped leaves and white trumpet-like flowers. Underground it produces fleshy white rhizomes that easily break into pieces and re-grow. Bindweed persists for a long time and can survive deep burial. This perennial weed prefers settled areas to disturbance and is commonly found along old hedgerows and seems to like walls too. Weed out thoroughly before planting your flowers, shrubs, hedges or fruit. 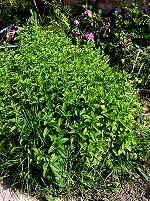 Bindweed may persist underneath a sheet mulch and grow out at the edges. But a vegetable patch provides plenty of opportunity by cultivation, planting, and harvesting, to erradicate this perennial weed and it will dimish. After weeding, you can slice off all regrowth with a hoe so it doesn't see the light of day. You'll soon be missing those pretty white flowers. Buds are at ground level and can grow into a dense leaf cover held 618 above ground. The leaf cover casts deep shade and soil becomes dry. The flowers, if left, are white umbels but germinating seedlings are virtually insignificant. 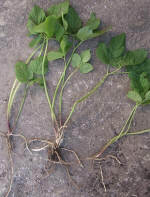 Ground Elder spreads by underground stems (rhizomes). The picture shows white stems growing horizontally and grey stems growing straight down before buds appear. The roots are fine fibrous and grow out from nodes on these stems. This perennial weed can easily find its way under a fence. Be sure to remove all the underground parts by forking it out and shaking the soil free. You'll often find it near old tips used to dump weeds. So leave it to dry before putting on the compost heap. Tagetes minuta has been noted for combating perennial weeds:- Ground Elder, Bindweed, and Couch Grass. It probably works by producing growth inhibitory root exudates. In the UK it is a half hardy annual. T. minuta grows 4-8 high and is also known as Stinkweed, Wild Marigold or Marigold. But in California T. minuta is itself listed as a noxious weed. Problems may be avoided by cutting down flowers well before seed dispersal. Consists of erect or horizontal fine stems but no leaves.The tough aerial stems grow from underground stems that can be deep so I prefer to use a spade. They penetrate hard surfaces such as tarmac and gravel. The plant also propagates from bulbils and may produce a cone which releases spores. This is not a nice weed among flowers because it is difficult to treat with herbicides. But it can be beaten organically. The absence of leaves is the plants weakness as only a small stem surface is available to gather sunlight. Therefore competition under the deep shade of bigger plants will set it back - a potato crop for example. See my page on growing potatoes for weed control. Ridding it from the flower garden may require a temporary change of plan. However, Equisetum has been used for scouring pans because it contains silicate and is also used by herbalists. has a rosette of marbled kidney shaped leaves and pretty yellow buttercup flowers with some petals paling to white in late spring. The neat clumps of this perennial weed become quite attractive if left undisturbed. It grows well in shady woods under shrubs, hedges and in settled areas such as orchards. It attracts early season insect pollinators to your fruit. Lesser Celandine seeds are often included in wild flower seed mixes but later it will smother early wild flower seedlings. So sometimes you have to intervene. Beware of digging it up. Lesser Celandine completes its lifecycle by early summer then dies down. The plant can reproduce from root tubers and bulbils. Bulbils are fleshy buds in the leaf axils capable of growing new plants. Both these reproductive organs easily break apart when you weed toward the end of its flowering period. They spread everywhere! You can use flame weeding to control Lesser Celandine from the time it first appears. A flame weeder doesn't disturb the soil. The best time to lift it out comes when petals first fade to white, before leaves begin to yellow and when the maximum number of new root tubers are still firmly attached. After this the plant breaks apart. When you dig up a clump of Lesser Celandine include the whole root ball and treat as if contaminated. You shouldn't add Lesser Calandine or connected soil to the compost heap. But you could submerge it for a few months then recycle. The weed leaves yellow quickly beneath a polythene or cardboard sheet mulch. But the plant can grow these shoots through several inches of loose organic mulch. So if you specialize in shrubs, fruit or planting out summer bedding you may tolerate this plant for its pretty yellow spring flowers. But leave it undisturbed. Because when cultivated it spreads everywhere as a perennial weed. Common buttercups have a 3 lobe stalked leaf arising in a rosette. Animals eating the leaves suffer a reaction from poisons it contains. It spreads by seeds and, similar to strawberry plants, by surface stems called stolons that root at the nodes. It's fibrous roots are shallow and this perennial weed is easy to weed out using a daisy grubber. Roughly translated means lions tooth and refers to lance shaped leaves edged into tooth like lobes. In lawns they grow flat and look unsightly. But in tall grass leaves grow erect and without lobes. The leaf rosette surmounts a tap root. The plant produces yellow composite flower heads that develop into feathery balls of seeds. Dispersal by wind should be stopped by slicing with hoe or shears or by mowing - there's more here on controlling lawn weeds. However the tap root grows down deep. If cut off even at depth it will usually regrow from the root stump. The stump may send up several branches. The picture shows how regrowth occurs from old root. When the soil is soft, use a fork to loosen around the plant. Otherwise dig as deep as possible with a spade to get the plant out. There's more information to help you remove Dandelions in lawns on this link. Dandelion is awkward when growing next to paths or between pavings. After cutting leaves, try placing a pile of stones over the plant - a dose of salt too. If it grows through the stones cut it off at ground level and replace the stones. Here's some more small tools to help you. Another perennial weed that spreads by seeds and regrows from a deep tap root. Spiny leaves form a tight rosette in the first year but in the second year the leafy stem extends into an erect flower stalk. The sturdy tap root can be dug out with the aid of a garden spade and gloves. 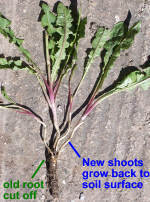 Thistles are susceptible to root aphids and these also infect lettuce which, belong to the same plant family. Eradication is also important to prevent thousands of seeds spreading on the wind. Yet another perennial weed that spreads by seeds and regrows from a deep tap root. The stem carries large rather leathery oblong or spear shaped leaves. You need to loosen the soil on all sides. I use a spade to get down as deep as possible. On light soils a fork may suffice. Removing the top 6 of root should prevent re-growth. Take care not to put them directly on the compost heap - instead wash soil off and place in a tub of liquid manure in the dark, or leave to dry out before composting. Note that Sorrel, also of the Rumex genus, is a smaller plant grown as a herb.